We believe that every prisoner needs to hear the good news of the Gospel of Jesus Christ. We believe that prisoners and ex-offenders are best reached and supported through genuine local relationships and we work hard at building long-term relationships through which we can deliver the support that they need. We work across the four countries of the UK with prisoners and ex-offenders. Our work is coordinated at a regional level by Daylight’s staff and rooted in local activity through trained volunteers visiting local prisons and helping ex-offenders integrate into a local community. 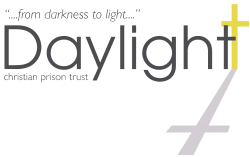 Daylight’s local network of support groups and volunteers means that prisoners and ex-offenders can be put in touch with someone in whichever part of the country they are either serving their sentence or being released to. We work with churches, chaplaincies, partner organisations, local supporters and trained volunteers to reach more prisoners behind bars and to support more ex-offenders after release. We will use the gifts given to the work of Daylight wisely and in a way that furthers the work with offenders and ex-offenders. We are accountable and transparent to our donors, funders and partners in order to maintain integrity in our work. Our work is marked by professionalism that enables us to work efficiently and effectively. Please see our doctrinal statement for more information.